My mother-in-law loves curried mussels so I came up with this dish as something fun for her to try. Traditional curried mussels are easy to make but most of the flavor is in the broth, which is usually very thin, making eating them pretty messy. I try to remedy that in this recipe by foaming the liquid. Then I remove the mussels from their shells and serve them individually with the foam on top. This turns a messy meal into an elegant and easy to eat party food. I like to serve this dish cold so I can make it ahead of time and it allows me to take advantage of gelatin for the foam. If you want to serve the foam hot you can replace the gelatin with 4 grams of agar and puree the gel before adding it to the whipping siphon. I call for 18 grams of curry paste but you can adjust this up or down depending on how strongly flavored you want the foam to be. 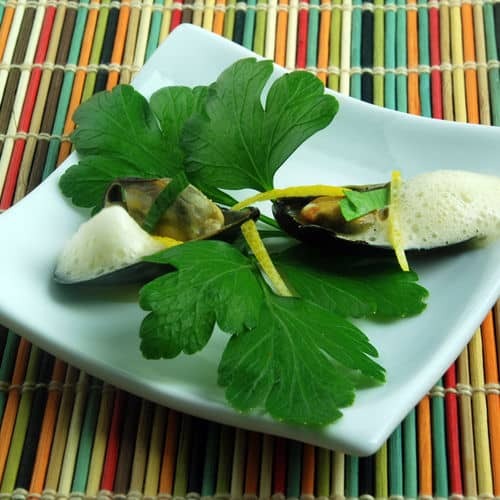 If you would like more information about the modernist techniques, ingredients, and equipment used in the mussels with curry foam recipe you can check out the following. Scrub the mussel shells to clean them. Add the canola oil to a deep pan or pot with the red curry paste and cook over medium heat until it starts to sizzle. Add the mussels, water, and beer then cover the pan. Turn the heat up to medium-high and cook until the shells open, 5 to 10 minutes. Remove the opened mussels and place aside until just cool enough to handle. Scrape the meat out of each mussel and set aside for later. Separate the top and bottom of the shell and reserve. Strain the liquid in the pan into a bowl and reserve. Place the gelatin in a pot with 100 grams of water and let it bloom for 5 to 10 minutes. Once bloomed, combine with the strained mussel liquid and remaining beer. Heat over medium heat while stirring until the gelatin dissolves. Remove from the heat and pour into a whipping siphon. Seal the whipping siphon and charge it fully. Place in the refrigerator for at least an hour or two to let the gelatin set completely. The foam can be stored in the refrigerator for several days. Place a mussel half-shell on a serving plate. Add a cooked mussel and then top with the curry foam, some parsley, and some lemon zest. This mussels with curry foam recipe turns a messy meal into an elegant and easy to eat party food. 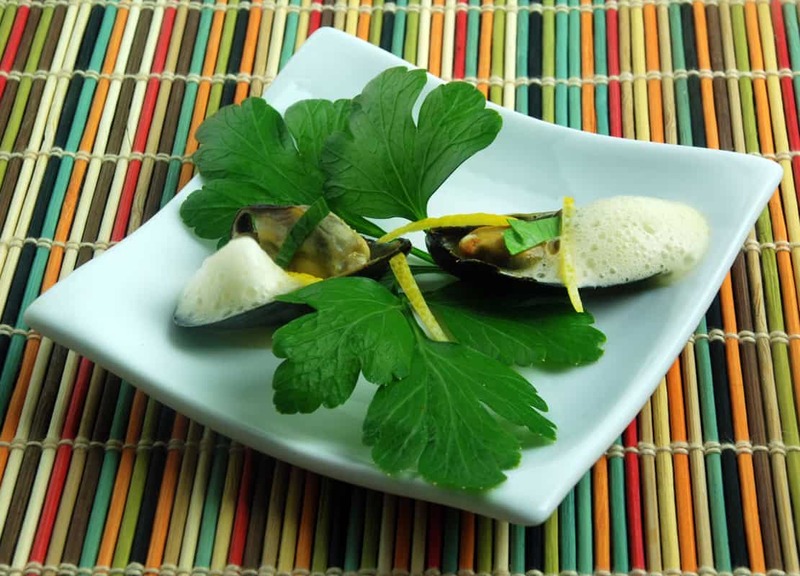 Each shelled mussel is topped with the flavorful fun foam - a unique party hit!